“Behold! Human beings living in an underground cave…” | china-land. The ‘Hong Kong Alliance in Support of Patriotic Democratic Movements of China’ opened the ‘June 4th Museum’ in late April of this year. Back in the 1980s, DengXiaoPing illustrated the ‘one country, two systems,’ “constitutional principle,” in order to keep the people of Taiwan, Macau, Hong Kong, and the PRC seemingly united. Thanks to this, Hong Kong still maintains free speech. The 6/4 museum is legal and educates those who seek truth about the events in 1989. My friends and I were able to visit the ‘June 4th Museum’ over the weekend. The museum itself is all in traditional Chinese. There are volunteers who roam, answer any questions and dispel any rumors. One such guide happened to be Chinese who was born in Hong Kong but went to college in Maryland and divided his time between Maryland and Hong Kong. He was incredibly informative and nice to talk to. He explained the layout. The museum is dark. It is a labyrinth as many people refer to the PRC as maze-like. To me it is very Democratic because there is a timeline going through and at the top is the Chinese government’s account of what happened at the bottom is the students’ account of what happened and as you follow along in the middle there’s a chalkboard to participate in and add your thoughts to. Our guide explained that about half the visitors are from Mainland China and they hope to properly educate these Mainlanders about this history. Souvenirs you could purchase were postcards, t-shirts, and USB-flash drives containing 8 GB of every video, document, every bit of truth pertaining to this event. I purchased one for David because he offered how much he wanted to see this museum.. This brief rush with Democracy China may or may not have had in 1989 is one of the only historical dates we study in USA’s secondary school. Not much about dynasties, emperors, Mao–the Cultural Revolution. 5,000 years of civilization summed up right there in Tiananmen. Much like Plato’s ‘Allegory of the Cave,’ the Chinese government has kept smoke in its citizens eyes. Stamping out our butterfly and pouring more smoke in. Now that smoke is money. ‘To get rich is glorious,’ coined by DengXiaoPing, made popular by Chinese migrants, the reason I’m in China, and why China is the world’s second richest economy. 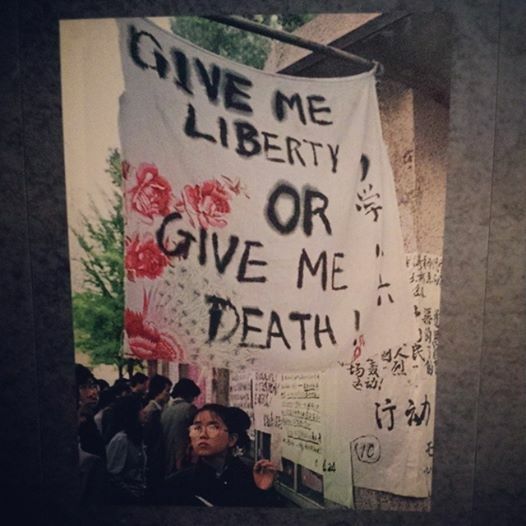 This entry was posted in Uncategorized and tagged 6/4, 64 museum, democracy, free speech, Hong Kong, Hong Kong Alliance in Support of Patriotic Democratic Movements of China, students protest, tiananmen massacre, tiananmen square. Bookmark the permalink.